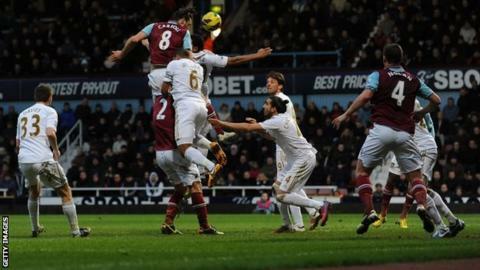 Andy Carroll scored on his first start since November as West Ham defeated Swansea at Upton Park. The striker, on loan from Liverpool, grabbed the winner late in the second half, leaping highest to head in from close range. Swansea keeper Gerhard Tremmel made superb saves from Kevin Nolan, Ricardo Vaz Te and Carroll. The visitors created very few chances, with Michu heading over from six yards in the second half. The encounter was, at times, a slightly drab affair, interspersed with moments of brilliance, in particular from Tremmel, who kept his side in the game until Carroll got the better of him with 12 minutes to go. In the first half, the German, who arrived from Red Bull Salzburg in 2011, twice denied Nolan from close range and the 34-year-old also showed strong hands to block long-range efforts from Mohamed Diame and Vaz Te, who cut in from the right a let fly from 20 yards. After the interval, Tremmel had barely had time to settle into his area before he was tested again by Vaz Te - clinging on to the Portuguese winger's low effort. Carroll was at the heart of most of West Ham's attacks during the match. The 24-year-old, a substitute at Fulham in midweek, had set up both of Nolan's efforts and finally managed an effort of his own when he flashed a shot over from 15 yards. He came even closer to scoring moments later, when the Swans' keeper produced an outstanding block with his feet to keep out an angled low shot. But he was not to be denied a third time, leaping to head in Mark Noble's left-wing corner from six yards out. It was relief for the Hammers, who would have felt hard done by had they not taken all three points from this match. Swansea's best player was former Valencia winger Pablo Hernandez, who weaved his way into the area in the first half before seeing his shot blocked, and then delivered an inch-perfect ball for leading scorer Michu in the second, only for the Spaniard to head over. The visitors came close to snatching a point at the last, but Jussi Jaaskelainen, largely redundant in the home goal, made a brilliant one-handed stop to deny Jonathan de Guzman. "I was wondering what the lads had to do to score a goal. We had a lot of balls flashing across the goal and over the bar. "Our defending has been our weaker point but we were very good. Swansea hardly created anything except in the last couple of minutes. It's a massive relief." "It could have gone either way. They had two good chances in first half through Kevin Nolan. In the second half, they had couple of chances, but they weren't difficult to defend. "Carroll scored a great goal and was difficult to mark. We had two or three chances at end of game and should have created more from the positions we were in. "We could have, and should have, created a little more but didn't have that last pass. I'm not happy with losing, but we didn't do anything specifically wrong."